How does induction heating work? Induction heating occurs when an electromagnetic force field produces an electrical current in a metal part. The surface of the part heats due to the resistance to the flow of this electric current. What characteristics of induction heating must be considered for a part? Three things – power (how fast to heat), frequency (how deep to penetrate), and time (how long to heat). What are the basic components that make an induction heating work cell? The induction power supply (induction heater), an inductor (coil) that is a shaped to contour the part, and a work station where the part is held and presented to the coil. What are the hardest geometries to heat with induction? 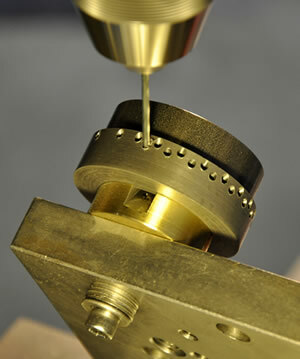 Inside diameters less than ¾ inch are extremely hard to fit a coil into and heat efficiently. Tiny coils will blow up if the power they are conducting exceeds their ability to remain cool. Sharp radii profiles are difficult to harden into. It is a copper loop that when energized and placed in close proximity to the work piece that causes it to heat. Induction coils are made from copper tubing and have water circulating through them to keep them cool. How are the power requirements for a job calculated? We use a value of 10KW per square inch of surface area to be heated. What are our length, diameter and weight capacities? 68 inches long, 15 inches in diameter and 400 pounds. What is our turnaround time? 24 hours per day and five days per week. What is our induction power supply range of frequency? What range of case depth can we produce? Can we carburize or overall quench and temper? What is our range for trucking? Chicago, Rockford, Milwaukee and everywhere in between.